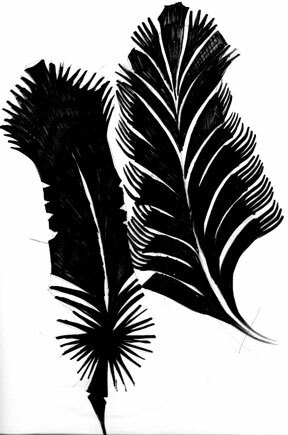 Working on a bunch of abstract feathers like look like iron. Not fluffy. Beautiful day today. No clouds. No humidity. Working with A. on plans for his 13th b'day. A little like pulling teeth, but we have gotten some place. Sent some images out for big giclees...for a show. Had to think about an "ARTISTS STATEMENT"...What is that? I just do this stuff...and whatever pops out...it pops out. No big thinking, unfortunately. I wish I could get my head into thinking more broadly and philosophically citing Aristotle or Susan Sontag or the groovemeister of the day...-- but it really is a series of ideas that arise, are masticated and come out either visual or not so visual and then I move to the next one. No grand plan. No clients. Just lots of ideas that make sense to me. This aesthetics thing about inspiration has me floored because everything is inspiring. The day, the smells, the news, the pictures, words, word combinations, colors, shapes, my mood, my friends and my kids,perfect coffee. It isn't one thing, it's the entire melange of all...nothing to point at distinctly, but the symphony of all of them together.